123 Animals storybook cotton panel. This fabric panel makes a great soft storybook for young childr..
Alpha Fish Alphabet storybook cotton fabric panel. This fabric panel makes a great soft storybook f.. Animal Alphabet storybook cotton panel. This fabric panel makes a great soft storybook for young ch..
Away in the Manger storybook cotton panel. This fabric panel makes a great soft storybook for young..
Baby Animal Alphabet Soft fabric storybook panel, Cotton Print Fabric Makes a great story book for ..
Bear Counts Cotton Storybook Panel. 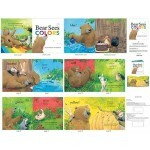 This fabric panel makes a great soft storybook to teach young c..
Bear Sees Colors Cotton Storybook Panel. This fabric panel makes a great soft storybook to teach yo..
Big Bear Small Mouse Cotton Storybook Panel. 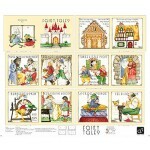 This fabric panel makes a great soft storybook to teac..
Calendar Babies storybook cotton panel. This fabric panel makes a great soft storybook for young ch..
Daddy and Me storybook cotton panel. 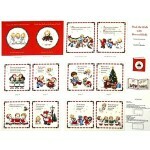 This fabric panel makes a great soft storybook for young child..
Christmas Soft storybook cotton panel is licensed by AMI! Morehead. This fabric panel makes a great..
Disney Bambi Nature Soft Storybook cotton panel makes a books that features Bambi in nature in a 10 ..
Fairy Tales storybook is a book with illustrations from classic fairy tales. This cotton panel make..
Good Sports storybook cotton panel. This fabric panel makes a great soft storybook for young childr..
Baby Sign language Storybook Cotton Fabric Panel..
Little Explorers storybook cotton panel. This fabric panel makes a great soft storybook about explo..
Little Light Christmas storybook cotton panel. This fabric panel makes a great soft storybook for ..
Love You Snow Much storybook cotton panel. This fabric panel makes a great soft storybook about lov..
Miss Kitty's Colors storybook cotton panel. This fabric panel makes a great soft storybook for youn..
Mommy and Me storybook cotton panel. This fabric panel makes a great soft storybook about being tog.. Moon and Back storybook cotton panel. This fabric panel makes a great soft storybook for young chil..
My Baby's Day storybook cotton panel is licensed by Joy Allen. This fabric panel makes a great soft..
Noah World Wide Flood storybook is a book about Noah and the world wide flood. This cotton panel ma..